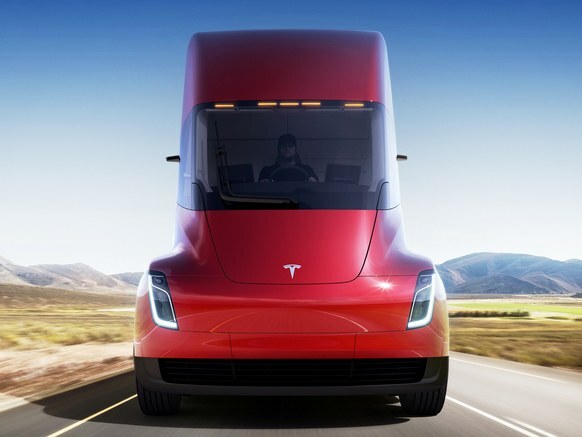 Elon Musk rolled out Tesla‘s biggest gizmo yet: a fully electric semitruck. The Semi can go a whopping 500 miles between charges, hauling 80,000 pounds along the way. And it can sorta, kinda drive itself—on highways, anyway. The truck comes with Enhanced Autopilot, the second generation of Tesla’s semiautonomous technology, equipped with automatic braking, lane keeping, and lane departure warnings. That may be true—about 4,000 Americans die in truck-related collisions every year, and human error is responsible for many of them. Self-driving trucks will certainly change lives. That goes double for the nearly 3.2 million people currently employed as delivery and heavy truck drivers. But we don’t know how: A dearth of research means that no one really knows what effect automation will have on the sector. It’s clear that truck driving will change, though, and companies testing autonomous trucking today in Florida and California and elsewhere show what that new future might look like. Trucking jobs are, as a recent report from the Washington, DC, think tank Global Policy Solutions points out, solid, middle class jobs. The median annual wage for delivery and heavy truck drivers is $34,768, 11 percent higher than the country’s median wage. Trucking has also been an opportunity for black, Hispanic, and Native American workers, who have faced serious, race-based barriers to entry in other blue collar jobs and are now overrepresented in the industry. Many trucking jobs are unionized, and the gig doesn’t require an advanced education. You probably won’t get rich doing it, but driving a truck is an option for those—men, in many cases—who might otherwise have done the kind of factory work that’s left the country in the last three decades or so. Losing these jobs outright could devastate them. Truck driving is, at the same time, a not-so-great job. Driving is solitary, physically inert, and psychologically exhausting. And long-haul truckers can be on the road—and away from family and friends—for months at a time. So people leave. In fact, there aren’t enough truck drivers to go around. The American Trucking Associations reports the annual driver turnover for large truckload carriers reached a whopping 90 percent this year, and it projects a 50,000-driver shortage by the end of 2017. Meanwhile, the freight shipping industry grows like Elon Musk’s plans for the future. Today, trucks carry 70 percent of all goods shipped in the US, about 10.7 billion tons this year, pulling in $719 billion in revenue. And thanks to a burgeoning economy and population, ATA expects the industry to swell by 3.4 percent annually until 2023. Robo-trucking could help the sector dodge growing pains. And, better, autonomous driving on highways should be easier to figure out than driving in cities, because those big rigs don’t need to navigate pedestrians, cyclists, and traffic lights. That means most of the country’s first experiences with driverless vehicles may be in the form of 70,000-pound trucks, instead of the kinds of driverless taxi services testing in sections of Pittsburgh and Arizona. But what does the future look like for truck drivers? That kind of depends on how you define trucking. Because autonomous big rigs aren’t going to be 100 percent autonomous, at least not in the near or medium future. The trucker doesn’t even need to be in the truck: Starsky Robotics—a Silicon Valley startup that employs six full-time truck drivers—would put the driver behind a screen, in a call center-like office. The company, which today is testing and collecting data on Florida highways, envisions one joystick-equipped driver manually guiding trucks through the trickier bits of operations, though construction zones and the last few miles between an interstate and distribution center, while the computer handles the bulk of the simpler, highway driving tasks. One driver might be able to handle up to 30 trucks per eight-hour shift, the company predicts. “These would be remote drivers who get to go home at the end of the day,” says founder Stefan Steltz-Axmacher. Maya Rockeymoore, who directs Global Policy Solutions and helped write the trucking report, says she’s been surprised by how little thought lawmakers, policymakers, and the automotive industry itself have given to the repercussions of their technology. When she took the report to industry meetings and congressional offices, “it wasn’t clear that any of them had done any modeling or forecasting or research about the impact of their disruptive technologies on the labor market before developing their technology,” she says. “It signals, perhaps, that disruption and the value of disruption itself as being a more important factor than the impact on society.” The first bill regulating self-driving technology is working its way through Congress, but commercial vehicles like trucks aren’t likely to be included in the final legislation. That means states will continue to decide individually how to regulate self-driving trucks on their roads. Morris, of Embark, says this lack of research is partly out of necessity. “It’s much easier to measure the things that you have now that might go away,” says Morris. “It’s much harder to measure the things that will be created through innovation.” Cars might have killed the buggy whip industry, but they created jobs in the hospitality industry, the oil and gas industry … and trucking.